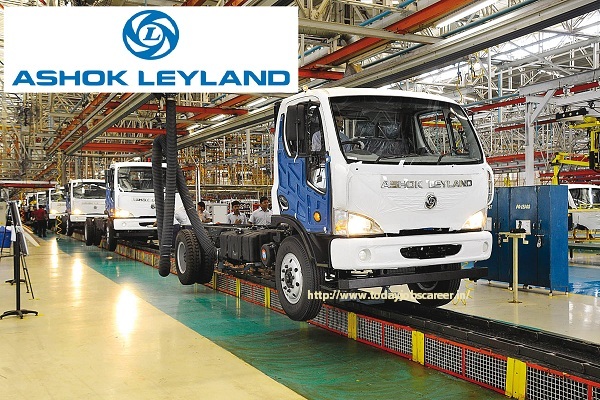 Ashok Leyland is an Indian automobile manufacturing headquartered in Chennai, India. Founded in 1948, it is the 2nd largest commercial vehicle manufacturer in India, 4th largest manufacturer of buses in the world and 16th largest manufacturer of trucks globally. Operating six plants, Ashok Leyland also makes spare parts and engines for industrial and marine applications. It sells about 60,000 vehicles and about 7,000 engines annually. It is the second largest commercial vehicle company in India in the medium and heavy commercial vehicle (M&HCV) segment with a market share of 28% (2007–08). With passenger transportation options ranging from 19 seaters to 80 seaters, Ashok Leyland is a market leader in the bus segment. The company claims to carry more than 60 million passengers a day, more people than the entire Indian rail network. In the trucks segment, Ashok Leyland primarily concentrates on the 16 ton to 25-ton range of trucks. However, Ashok Leyland has a presence in the entire truck range starting from 7.5 tons to 49 tons. With a joint venture with Nissan Motors of Japan the company made its presence in the Light Commercial Vehicle (LCV) segment (<7.5 tons). We are the 2nd largest manufacturer of commercial vehicles in India, the 4th largest manufacturer of buses in the world and the 16th largest manufacturer of trucks globally. With a turnover in excess of US $ 2.3 billion (2012-13) and a footprint that extends across 50 countries, we are one of the most fully-integrated manufacturing companies this side of the globe. 1.After Chassis Products/Bus Body, CAD/CAE/PLM, Engine Design, Power unit Research & Development, Prototype Validation, Testing, Vehicle Engineering, Simulation. 2.Industrial Engineering, Logistics and Supply Chain Management, Maintenance, Manufacturing Processes (Automotive, Foundry, Metallurgy), Materials Management, Production Engineering (Process Planning/Project Planning), Quality Assurance. I am currently working in Trimble company as a service engineer (gps department) I am completed my graduation also if any vacancy is available plz give mi chance I am interested to work with Ashok Leyland company.